Interstate 64 travels for 124 miles across Southern Indiana following the route of the old U.S. 460 upon its completion in the late 1970s. The interstate was originally planned to go from Louisville along U.S. 150 to Vincennes before heading west across Illinois along U.S. 50. But political influence from Evansville, the third largest city in the state and largest at the time that was not connected via an interstate, moved the highway south to the U.S. 460 alignment. The resulting highway however is the most scenic among Indiana interstates. It crosses the Wabash River from Illinois and passes about 20 miles through rolling fields to the north of Evansville where it connects with U.S. 41 and Interstate 164 / Interstate 69 / Indiana 57. From there, the terrain gets hillier as it crosses the Hoosier National Forest in dramatic fashion. The Interstate passes by Corydon and New Albany as it descends the Knobstone Escarpment before crossing the Ohio River via the Sherman Minton Bridge into Louisville, Kentucky. Interstate 64 spans the Ohio River over the Sherman Minton Bridge between New Albany and Louisville, Kentucky. The bridge opened in 1962 at a cost of $14.8 million.1 Photo taken by Justin Cozart (06/05/08). 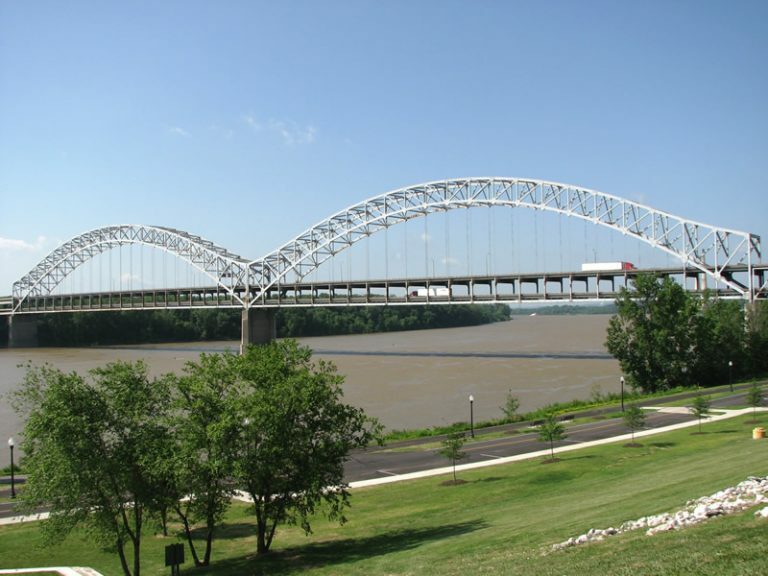 The Sherman Minton Bridge was closed on September 9, 2011 after inspections revealed cracks in two steel support beams supporting the lower bridge deck. Emergency repair work, focusing on repairing welds used in the original bridge construction, continued until the bridge reopened on February 17, 2012. U.S. 231 meets Interstate 64 at a six-ramp parclo interchange north of Dale in Spencer County. The exchange was constructed as part of a project to construct an expressway for U.S. 231 northward from Chrisney to Gentryville, Dale and I-64. The new alignment replaced a diamond interchange situated just east of the current crossroads between the two routes. Photo taken 06/07/12. Crandall Lanesville Road enters a diamond interchange with Interstate 64 just south of the intersection with Lanesville Road in eastern Harrison County. The rural exchange lies 2.2 miles north of Lanesville and SR 62. Photo taken 11/07/11. The Sherman Minton Bridge across the Ohio River is a 11 mile drive east from the Crandall Lanesville Road on-ramp to Interstate 64. Photo taken 11/07/11. Crandall Lanesville Road rises from Indiana 62 and Lazy Creek to meet Interstate 64 north of Corydon Ridge Road. Photo taken 11/07/11. Travelers and commuters bound for Louisville join Interstate 64 east from Crandall Lanesville Road. The split with I-265 east to Clarksville is nine miles. Photos taken 11/07/11. A lightly traveled and scenic drive continues Interstate 64 west from Crandall Lanesville Road to Hoosier National Forest and the Evansville area. Photo taken 11/07/11. 11/07/11 by AARoads. 06/07/12 by Thomas Decker.